In third grade, Anthony Potts landed a role in a music production at Collinswood Language Academy in Charlotte that would chart the course of his life. At 8 years old, he was tapped to rap the Freedom Williams part on the ubiquitous C+C Music Factory hip-house hit "Gonna Make You Sweat." Anybody who's paid attention to popular culture over the past three decades or so knows the spine-tingling power of that part — it comes amid the song's iconic staccato electric guitar riff and Martha Wash's sung-screamed vocal hook, "Everybody dance now." Nearly two decades later, Potts pulls the rhymes out of his head like he performed it yesterday: "Here is the dome / Back with the bass / The jam is live in effect and I don't waste time / On the mic with a dope rhyme / Jump to the rhythm / Jump, jump to the rhythm / Jump..."
Potts busts out laughing. 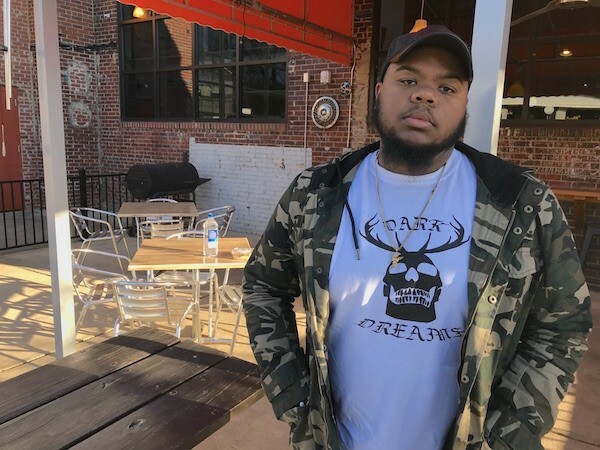 The 26-year-old rapper who today goes by the name Phaze Gawd is sitting at a table inside the Rhino Market in Wesley Heights in a camouflage jacket over a white T-shirt with the words "Dark Dreams" circling an image of a human skull wearing antlers. Dark Dreams is Phaze Gawd's latest EP, a collaboration with his longtime friend, the producer and singer Anthony Toro, who calls himself A Man with Antlers — or AMWA, or just Antler. 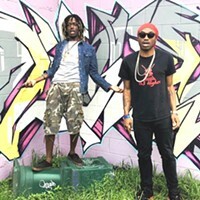 In the next few weeks the duo will be performing songs from Dark Dreams at various venues across the region, notably the New Era Music Festival, which will feature a who's who of Charlotte and regional rappers at the New Era Music House on Saturday, April 21. But right now, Potts is just happy the EP is out, and that the duo has put the final touches to an accompanying 4-minute short film (below) made by Charlotte videographer Barry Espy. It stars Phaze Gawd as a patient in a therapy session. The Dark Dreams EP is a departure for Phaze Gawd, whose previous solo releases place him front and center in the mixes. On Dark Dreams, he says, the music and concept — an exploration of the darkness just below the surface of our awareness, what psychologist Carl Jung would call our "shadow consciousness" — is equally divided between Phaze Gawd and AMWA. "To be honest, I think it's probably more him than me," Potts says. "He produced it, he mixed and mastered it, that's all him singing, he's doing most of the hooks." Potts lets out a muted laugh. "Really, I only have one verse per song and the little speech at the beginning." In that little speech, Phaze Gawd defines the terms of the duo's project over a little fluffy cloud of synth music: "Dark dreams don't equal nightmares," he says. "See, nightmares visualize our fears; they feed off what we're afraid of . . . 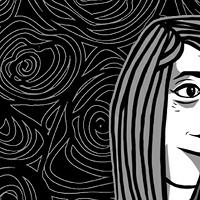 Dark dreams — they're different. They thrive on our impurities and our honesty. They mirror our true selves. So, I guess the real question is: Which is worse? Nightmares? Or dark dreams?" From there, the 6-song EP launches into the title track, in which Phaze Gawd raps about being up late at night, his thoughts "running kind of sordid ... my morals are morphing, my dreams are distorted." Much of the lyrical content centers on the duo reflecting on getting older. The two are contemplating turning 30 in a few years, still partying and making music, and wondering what that will mean with kids and responsibilities coming. In "Right Now," the duo deals with living in the moment: "Antler's got a baby, now we on a mission," Phaze Gawd raps, and he's followed by AMWA singing the hook in a heavily Auto-Tuned voice: "Any time, any minute, every hour, every second... right now, right now." 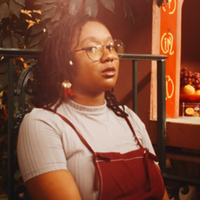 On subsequent tracks such as "Like Me" and "Take Off," AMWA's Auto-Tuned vocals flutter birdlike through lines like, "I just want to take off, and never, ever, ever land." The EP closes with "I Lost Myself," which finds Phaze Gawd rap-singing the existential conclusion, "I lost it all / Trying to find myself and find the wealth for you/ I lost it all, finding confidence in designer belts and cool ... I had to take it off." It's heavy stuff, but the two had a blast making it. "This is one of the most enjoyable collaborations I've ever done," Potts says. "Me and Antler are so similar — we're damn near the same person. My name's Antony, his name is Anthony. He's a Scorpio, I'm a Scorpio. We're both pretty chill guys. And we both have the same ear for music. " Toro, who calls the EP "kind of a spectrum of emotions," agrees. "It's an awesome feeling when you can just play something or hear a sound together and be like, 'Yeah, let's use that,'" Toro says. "We just have a chemistry that some artists don't have." 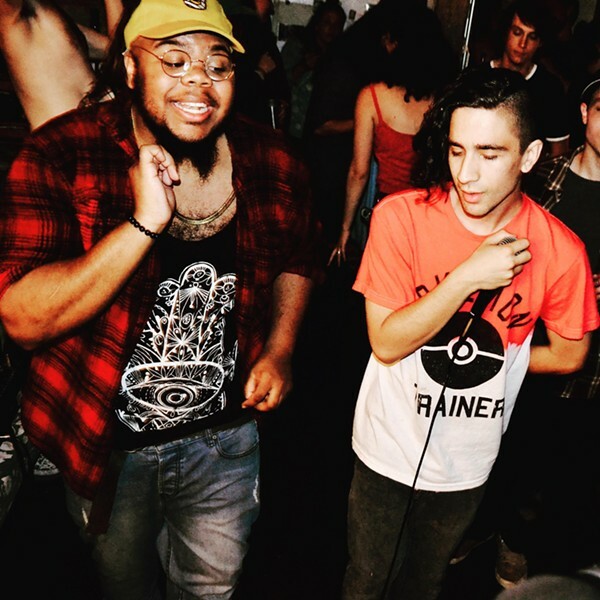 Toro, who produced an earlier Phaze Gawd EP, OhDeerGawd!, in 2016, says that over the course of this project and earlier collabs, he and Potts have become like family. Family is important to Potts. He cites his saxophone-playing father Gary Potts — who performs in numerous Charlotte-area R&B bands as Saxxy G — as a huge influence. Though their tastes differ, the younger Potts remembers his dad playing music around town when Tony and younger brother Michael were kids. "Pops is multi-talented. The man is awesome," he says. "That's where me and my brother get it from." Potts' brother Michael performs around Charlotte as rapper Bino. But the Potts kids were not allowed to listen to hip-hop as children. While their dad is agnostic, their mom is a strict Jehovah's Witness who eschewed holiday and birthday celebrations. And she didn't let them listen to rap. When Tony eventually saved enough money to buy his own records, the first one he got was a Juvenile best-of collection. "Then I got Lil Wayne's first Carter album," he says, "and then I got into the Cash Money stuff." He was hooked. By the time he got to Olympic High, Potts was already making a name for himself among his fellow hip-hop heads. One school mate was Tizzy Farragami, who today raps with Daquan "Kizzy" Bolton in the duo Th3 Higher. Farragami laughs as he remembers their school days. "He had a mixtape called Hoopty Muzic," Farragami remembers of Potts. "He's always been a beast. He won hella talent shows and has been working his following since high school. We grew up in the same neighborhood." After graduation, Potts attended the University of North Carolina Charlotte for a minute, but dropped out to focus on his music. 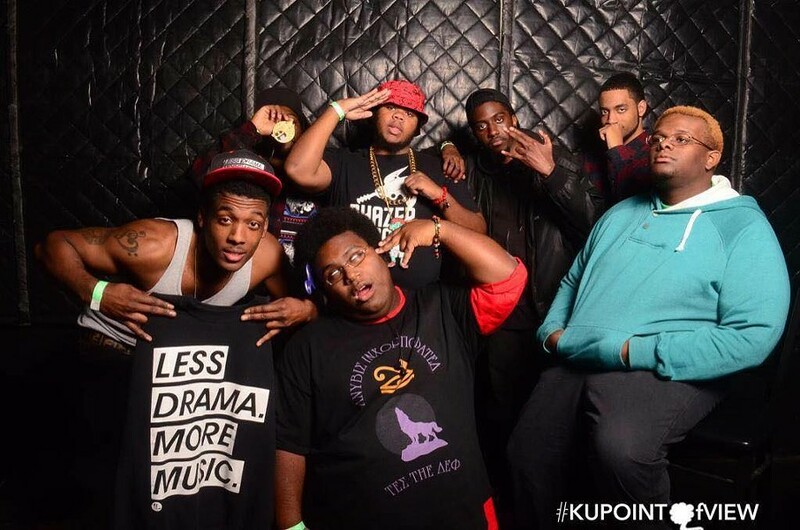 In 2012, he and several other rappers and artists formed the Phazer Gang collective, releasing a mixtape in 2014. Back then he called himself Tony P. "We were a multimedia unit," he says. "That was the idea when I put it together, because we did music, we did art, we did film and video, and photography." West: "When someone comes up and says something like, 'I am a god,' everybody says, 'Who does he think he is?' I just told you who I thought I was. A god ... That's who I think I am. Would it be better if I had a song that said, 'I am a n***a?'" "I thought that was the realest thing," Potts says. "I mean, we can call ourselves anything [as black men], but as soon as we start calling ourselves what we do believe we are, people want to get up in arms. I really felt that. It really spoke to me when I heard that interview. So I wanted to use it in the song." GAWD also includes a song and video (produced by Espy) that has taken on renewed resonance in the wake of superstar evangelist Billy Graham's death. The track, "Billy Gram$," came about when Potts was driving along Billy Graham Parkway one afternoon in the area where the rapper grew up near the South Carolina border. "That's a pretty long stretch, you know, and I was just kind of taking note of things, passing by the Billy Graham Library and stuff," he says. "I had been working on my music, and those lyrics just came to me, so I wrote that song." In the video, which won Best Male Hip-Hop Music Video at the 2017 Carolina Music Video Awards, AMWA is dressed as Jesus and Phaze Gawd is clad in numerous outfits including one that has him in an all-black clergy suit and black Quaker hat as he raps lines like, "Better sit up for this sermon / The devil's a lie / I can see 'em all squirming. Preach." The lines are followed by the chanted refrain of "Billy Grams" that transforms into a banger with a great call-and-response for audiences when Phaze Gawd performs it live. "That song has become kind of an anthem for me now," Potts says. "It's one of the most-requested songs when I'm performing. People always ask me, 'You gonna do "Billy Gram$"? You gonna do "Billy Gram$"?' I can't not do 'Billy Gram$' now, or people will get upset. And that's pretty awesome." Potts followed GAWD with two more EPs in 2016 — Definitive Theosis (produced by the late, phenomenally talented DFLN) and the AMWA-produced OhDeerGawd! The former is a jaw-dropping mix of cutting-edge experimental production that Potts considers his all-around most well-crafted work. But shortly after Definitive Theosis dropped, DFLN — whose music had been championed by likeminded name producers from Flying Lotus to N.C.'s 9th Wonder — died. "We had just talked a few days before," Potts remembers. "It was heartbreaking to hear that he'd passed. He had some huge opportunities lined up for himself, and to see that not come to fruition is a huge loss for the Carolina beat scene and the music scene in general. I was blessed to work with DFLN." With Potts' upbringing by a Jehovah's Witness mother and agnostic father, and so much religious imagery running through his catalogue — not to mention his stage name Phaze Gawd — the elephant in the room is the quesiton: Where does he see himself in terms of religion and spirituality. "As far as me being religious now, I'm not really," Potts says. "I think of myself more as being spiritual, but even there, I'm at the lesser level of it. I'm just kind of myself. I just kind of drive myself to what feels right." What felt right when he was 8 years old was rapping that Freedom Williams part in "Gonna Make You Sweat" at Collinswood elementary. "I enjoyed being onstage so much," Potts says. "I knew this was what I wanted to do from that point on. And after that, I just started writing — short stories, lyrics, stuff like that. And here we are." He flashes a big grin. "I haven't stopped." Neither have his dark dreams, though he insists he's not afraid of them.